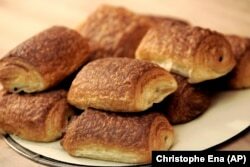 There are many common foods shared between countries, although they may be cooked differently. But whichever side people fall on -- a big breakfast or small one -- chances are it involves a cup of coffee or tea. Americans are not very creative when it comes to breakfast. That is not to say we don’t have many choices. We do. Common breakfast foods are bacon and eggs; bagel with cream cheese; pancakes or waffles with a side of sausage; sandwiches with egg, cheese and vegetables; oatmeal topped with dried fruit and nuts; or if we’re in a hurry, a bowl of cold cereal with milk. 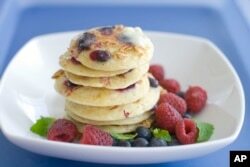 Blueberries pancakes are a breakfast favorite in the U.S. 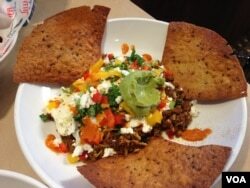 These are made with granola and are served with fresh raspberries on the side. 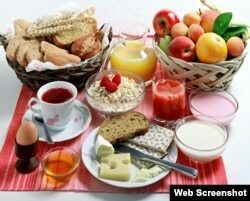 But some foods are simply not on the family breakfast menu -- things such as a whole fish, olives, tofu, pasta or rice. In fact, if you serve salmon leftover from dinner for breakfast, you may hear people say, “That’s not a breakfast food!" A breakfast with a little bit of everything! Several food websites also say that Koreans eat the same foods at breakfast that they may eat at lunch and dinner. So, you might have rice, kimchi (a traditional spicy pickled cabbage), soups with tofu and pickled vegetables. One website says Korean people like to add any leftovers from dinner the night before to breakfast – which is simply a great idea. 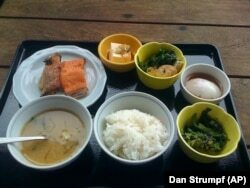 Japanese breakfast may include rice, noodles, fish and miso soup. 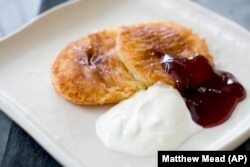 A Russian breakfast may include a cheese-filled pancake with fruit jam. Anna Matteo wrote this story. George Grow was the editor.